Email is still the killer app for engagement. If you show up in someone inbox consistently (with permission), you are relevant. If you’re writing emails to your list – newsletters, promotional notices, anything with a call to action, you really need to get a good handle on writing amazing subject lines. Here’s 5 ways to think about copywriting your email subject lines so that people open them consistently and immediately when showing up in their inbox. Do you have any other tips or insights on how to get your emails opened? Share your ideas below. Did you know that 90% of users out there primary consume content. While 9% curate it. And only 1% create content. If your nonprofit or church has a YouTube page, you are part of the rare breed of content creators. But that’s not enough. With 70 HOURS of video uploaded every single MINUTE, your audience needs your help. The 90% — content consumers — are looking for content curators to help them sort through the millions of hours of video available today. One way to do this on YouTube is via Playlists. Instead of being presented with a random smattering of videos in your account (by upload date), your audience gets the chance to find sequences of videos that make sense and are related to each other. The end result is better engagement with your content because they can go deeper, or discover new categories of video content that you offer. Click the Add to button under the video you’re watching. From the drop down menu, type in the name of your new playlist and click the Create playlist button. You can choose if you want your playlist to be public (viewable by others) or private (only viewable by you). Sign into your account and click on your username in the upper right corner of your screen. Click on Video Manager in the expanded menu. Click on the Playlists tab on the left side of the screen. 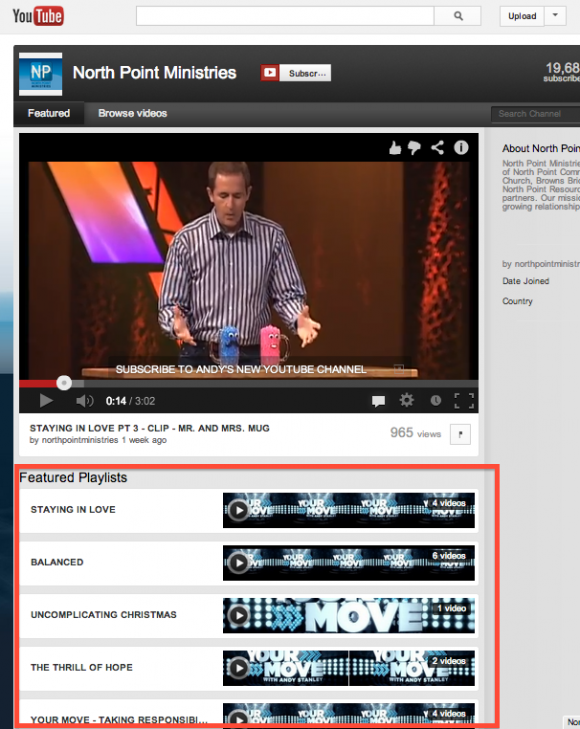 Click the +New Playlist button and enter in a Playlist title and description. Click the arrow next to the Add to button under the video you’re watching. From the drop down menu, select the Playlist you want to add your video to. Do you have playlists set-up on your YouTube channel? Please feel free to list the link to your YouTube channel here so others can see some examples in action!